PAY ATTENTION TO WHO SAID IT, WE HAVE JUST "QUOTED"
Some Mormons know that Michael became the man Adam. He set the pattern for us. He fell that men might be. Journal of Discourses 6:275 Adam and Eve ate gross matter (of this earth) to produce mortal bodies for their spirit children. J D 4:217-218 Adam ate coarse material until his system was charged with it and he could produce mortal children. J D 13:145 For Adam and Eve to eat forbidden fruit was part of the eternal plan - don't blame Eve. J D 7:158 Man partook so he could know good and evil. J D 2:302 Adam ate and fell, "No other way." J D 7:285 Our parents were brought from another planet. J D 8:244 Adam brought seed and animals here. J D 3:319 Adam made like you and I on another earth. J D 3:319 Brought a wife with him. J D 8:208 If faithful, women to become Eves. J D 18:326 Joseph Smith knew Adam well, could describe him. J D 15:320 Resurrected bodies beget spirit children. J D 10:235 Adam came to people this earth. To say that Adam is not God, is like saying that Jesus is not God, because, he prayed to God. The "ARCH" over a door spans the void to both sides. It ties the two together. So did Adam, he spanned the ARCH from our spirit creation (organization) to our mortal (physical) beginnings, as he was the first. OUR FATHER "MICHAEL, (Adam) mine ARCHANGEL,..."
"Now the Spirit speaketh expressly, THAT in the LATTER TIMES SOME SHALL DEPART FROM THE FAITH…FORBIDDING TO MARRY"
Now in our time the Mormon Leaders say: in "1976"
ENSIGN, November 1976, page 77) Spencer W. Kimball also said "All is Well in Zion" HERE. This same Mormon Apostle said at the October 1980, Mormon Church conference in Salt Lake City: "Then was Adam our God, or did God become Adam? Ridiculous! If any of you have been confused by false teachers who come among us, if you have been assailed by advocates of erroneous doctrines, counsel with your priesthood leaders. (follow the brethren) They will not lead you astray, but will direct you into paths of truth and salvation. Those 2 men, and others who preside over the Mormon Church and are great businessmen, but are not Apostles of the Lord Jesus Christ. They run the Church from the Church Office Building, as the tallest skyscraper in Salt Lake City, Utah. See TPJS 215 Test everything by the WORD of God! 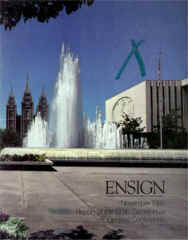 Below is the Cover of the November 1980 "Ensign" magazine which shows the World Map on the LDS Church Office Building. Nephi; "…I beheld that they (THEY) were in a large and spacious building…BEHOLD THE WORLD and the wisdom thereof… the great and spacious building WAS THE PRIDE OF THE WORLD (see the World map on the front of it--easy to see from North Temple street in Salt Lake City) and IT FELL…(to the north, towards the Capitol at the top of State street) Thus SHALL BE the destruction of ALL nations…"
"He that hateth me hateth my Father also"
"He that honoreth not the Son, honoreth NOT THE FATHER which hath sent him. Verily, verily, I say unto you, He that heareth my word, and believeth on him that sent me, hath everlasting life..."
This is looking across the Fountain at the Temple in the background. The World Map can be seen below the Green X in the sky. These World Maps are on both sides of the Church Office Building. This picture was on the Cover of the November 1980 "Ensign" Church Magazine. This photo was on the Front Page of the Church News on the week Ending April 5, 1980 The Church News is published by a Salt Lake City Newspaper owned by the Church. This is a great photo of the Mormon Church Office building. The paper is The Deseret News. Look at the Map on the front which shows Africa and Asia. Enough of the pictures, now some scriptures to realize that prophets thousands of years ago saw our time. About 2600 years ago, two prophets saw our time and wrote: "And I also cast my eyes round about, and beheld...a great and spacious building; and IT STOOD as it were IN THE AIR, HIGH ABOVE THE EARTH . And it was filled with people, both old and young, both male and female; and their manner of dress was exceeding fine; and they were in the attitude of mocking and pointing their fingers towards those who had come at and were partaking of the fruit. And now I, Nephi, do not speak all the words of my father. But, to be short in writing, behold he saw OTHER multitudes pressing forward; and they came and caught hold of the end of the ROD OF IRON ; and they did press their way forward, continually holding fast to the ROD OF IRON, until they came and fell down and partook of the fruit of the tree. AND he also saw OTHER MULTITUDES FELLING their way TOWARDS THAT GREAT AND SPACIOUS BUILDING. And GREAT was the MULTITUDE that did enter INTO THAT STRANGE BUILDING. For he (God) IS THE SAME yesterday, today, and forever; and the way is prepared for all men...if it so be that they REPENT and come unto him. For he that diligently (with much effort) seeketh shall find; AND the mysteries OF GOD shall be unfolded unto them...And it came to pass that I beheld that the ROD OF IRON, which my father had seen, WAS THE WORD OF GOD...and whoso would hearken unto the word of God, and would hold fast unto it, they would never perish..." (1 Nephi 8:26,27,29,30,31,33; 10:16-19; 11:25; 15:24; From the Book of Mormon, written 600 B.C. AND translated by Joseph Smith First published in 1830 and read by millions who don't realize what it means. "IF," you want to learn some more see 2 Nephi Chapter 3 where he talks about the FRUIT 19 times, in that one chapter. The GREAT MULTITUDE IN THE CHURCH is now over 10 million, And their names and records as members of the Church are kept in that building! 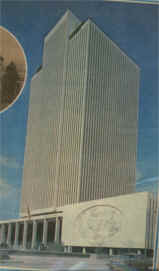 That Great and Spacious Building as it stood high in the air. Some fools say the Book of Mormon is false--so what do you think now? Do "FACTS" matter, OR would you have turned O.J.Simpson loose? Because of your traditions. You just cannot see the facts. CLICK HERE to see if FACTS matter to you.